The Chrysler Building is an Art Deco skyscraper in New York City, located on the east side of Manhattan in the Turtle Bay area at the intersection of 42nd Street and Lexington Avenue. Standing at 319 metres (1,047 ft), it was the world's tallest building for 11 months before it was surpassed by the Empire State Building in 1931. 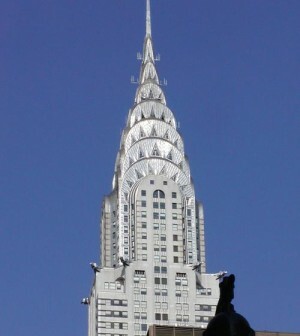 After the destruction of the World Trade Center, it was again the second-tallest building in New York City until December 2007, when the spire was raised on the 365.8-metre (1,200 ft) Bank of America Tower, pushing the Chrysler Building into third position. 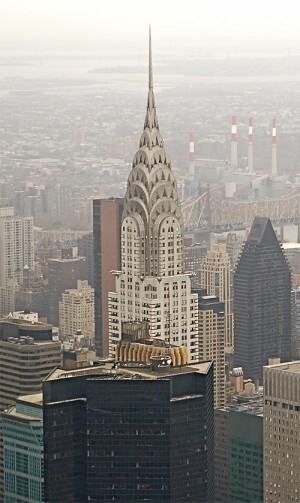 In addition, The New York Times Building which opened in 2007, is exactly level with the Chrysler Building in height. The Chrysler Building is a classic example of Art Deco architecture and considered by many contemporary architects to be one of the finest buildings in New York City. In 2007, it was ranked ninth on the List of America's Favorite Architecture by the American Institute of Architects.